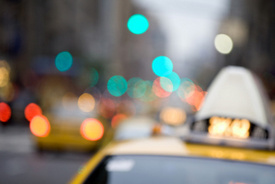 New York, NY — A NYC taxi driver and a tourist were killed on Saturday, June 2, 2012, in a three-vehicle collision. The fatal automobile accident occurred around 12:30 a.m. on the Long Island Expressway, MyFoxNY.com reported. According to police, the cabbie, 46-year-old Mohammad Hussain, was transporting two tourists from Kennedy Airport to Manhattan when the taxi rear-ended a 1995 Porsche on the Expressway. The impact caused the taxi to overturn onto its roof, where it was hit by a Mack garbage truck. Due to the rain-slicked roads, the Mack truck wasn’t able to stop in time to avoid the collision. Responding emergency crews rushed Hussain and a passenger, 60-year-old Utah resident Suzanne Nicholson, to Elmhurst Hospital in Queens. They were pronounced dead after arriving for medical treatment. Nicholson’s 11-year-old grandson sustained a broken rib and was also taken to Elmhurst, where he is in stable condition. The 33-year-old driver of the Porsche and the 61-year-old garbage truck driver were not injured in the wreck. Police do not suspect any criminality in the accident at this time. Investigations are ongoing.